Well, before I hunker down to get something done around here, I thought I'd post a few screencaps I made over the weekend. This night scene is necessarily very dark. It has the degree of darkness I would have preferred in the scenes of Gondor under seige in RotK, but only got when it was supposed to be the actual night. The darkness sent by Sauron never was portrayed. Which could end up looking nonsensical: as pretty as the scene was, what was the sense of Gandalf lifting his staff to emit a ray of pure light to repell the Nazgul as they swooped down on Faramir's men on the Pelennor, when it was broad daylight?. In the screencaps below, to make the frames more visible on the relatively small screen of a computer monitor, I have brightened them all. On the big screen in a dark theatre they didn't need it. 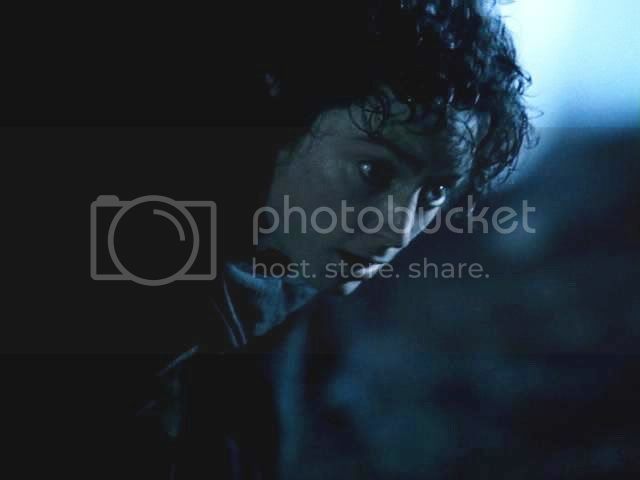 The original frames have their own broody beauty left dark -- very dramatic, and Frodo, as usual, is stunning in all of them. But they really are too dark to see on a small screen in a lit room. 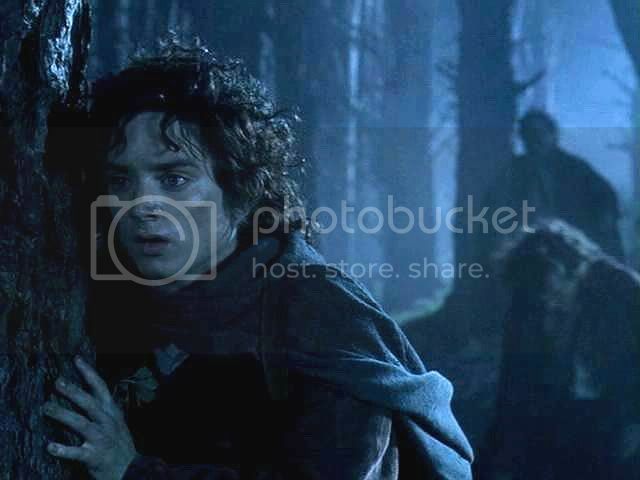 When I think of "blue Frodo" shots, I usually think of him as he appears in Galadriel's glade. He is unbelievably gorgeous in those Lothlorien frames, as is Galadriel (until she goes nuclear). They aren't just "blue" -- they glow -- with eerie, chilly, nearly celestial radiance. The sort of blue in the scene below is very different -- dark and stark -- suitable for a desperate escape by night. Hey there Mech! 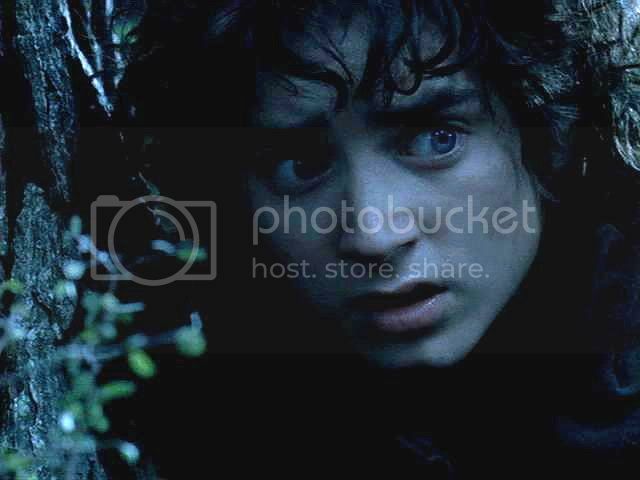 Wow, see now, I've watched FoTR countless times and never noticed just how pretty Frodo looks here. 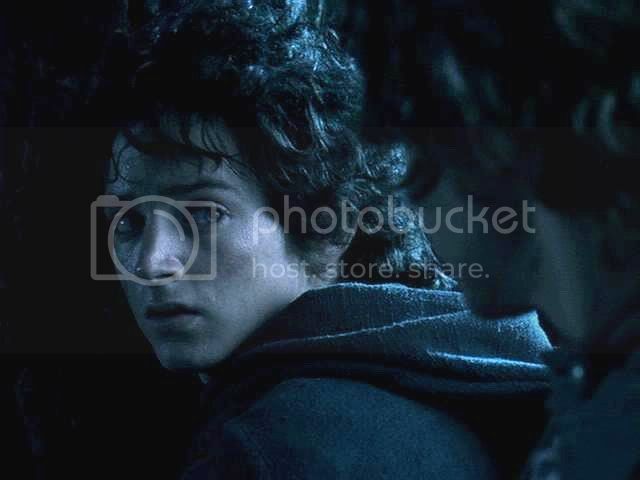 I like blue Frodo. He looks good in blue. 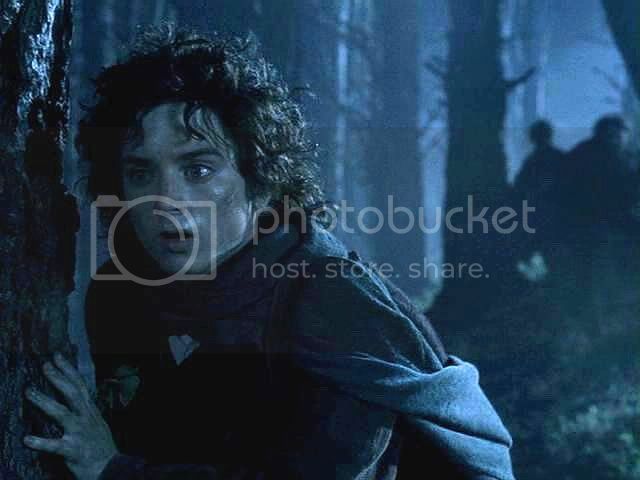 I guess I didn't realized how much time Frodo spent blue! And I also just read your post about Rachel choosing Hawaii. I'm so impressed with her, jeeze, Hawaii is so far away! Brave girl! I stayed in the same city I've lived in since I was 5, and often I wonder what it would have been like to have ventured to another state. It's like a choose your own adventure book! Too bad we can't read it from the back (that's what I always did as a kid) Anyway, there I go rambling again! I know you had really been hoping for Montana (Which is gorgeous, by the way, I had no idea) but it's good that you are willing to let her follow her heart. Good mom! Will you be doing a Hawaii campus visit now? Thanks, Bree, for stopping by. I have been hoping you are well and wondering how your mom is doing and how you are doing as a family working through this with her. Have a missed a recent LJ entry? As for Hawaii, we actually scraped and saved and used a gift from my mother to take Rachel to Hawaii this time last year. That was when she toured the little college in Hawaii (not the state university). We were hoping when she really saw the place she might be disenchanted. Ha! She loved, loved, loved it, saying, "I just have a feeling, Mom, like, this is it!" My mom is doing GREAT! She's starting to grow hair back (it's about a 1/4 inch long now) and she's back to nagging and cleaning the house! She's still a bit disheartened by the numbness and lack of movement in her face from the nerve damage, and though it's a slow process, it IS improving--bit by bit. We're VERY blessed to have friends and family who are being so helpful and loving. And, to top it all off, she and my dad have planned a trip to Disney World for their 25 anniversary in April. Thank you so much for asking! And so is Rachel plannning on the college or the State University? I can't even imagine... school in Hawaii... it would be like a permanent vacation. What a great environment for learning, don't you think? I know that I feel much more open to school on breezy beautiful days than when it's gloomy and cold. Of course... I guess it could be a bit distracting, too! That's great news about your mom, Bree. Woo hoo! I hope they love their trip to Disney World. Rachel wants to go to Hawaii Pacific University. It's just a small little college (not state) on Oahu. It has a "campus" downtown (some buildings and space in buildings) in Honolulu, in a very pretty area with a pedestrian mall. A shuttle run by the college runs every 15 minutes to take students over to the other "campus" over the Pali pass, above the town of Kaneohe. It's just a few dorms and one biggish building that has the cafeteria, offices and ALL the other classrooms, including all of the classes for math, sciences and nursing. Even Rachel was taken aback to see how small and uncampus-like the place is, but there's no denying the setting is lovely. One of my best friends, who taught college in western Minnesota, has a next door neighbour (my friend still rents out her house although she now is teaching elsewhere) whose daughter just finished the nursing program at this college. She seems like a solid, smart, adventurous young woman, and she thought the nursing program there was just great. So, that's encouraging, since it's so far away and is going to sink us into massive debt forever. Lovely shots, and I also appreciate your wish that Sauron's "darkness" had been part of the film. Actually, it's a shame that *Shelob's* "darkness" was underplayed, as well, since a lot of the effect of the phial was lost because the tunnel wasn't really that dark. Ah well! No kidding about the phial, Shirebound. I suppose it would be impossible to shoot a decent film scene in the the darkness of Shelob's lair (pitch black). But they could have left the lighting really, really low long enough for the Light of Earendil to amount to something. That light, as well as the light Gandalf used against the dark enemies in every instance (on the Pelennor, in Moria), was not supposed to be effective because it had magical properties, but simply because the adversaries had such an antipathy to light as such -- but especially this very pure sort of light. The film's use of these light sources made them look like they had to be some sorts of 'magic beams', since they appeared in environments already illuminated. If their light "worked," it had to be because the light they emitted had some sort of super-added, special powers. That is exactly what Tolkien did not write. Yes, you are so right. 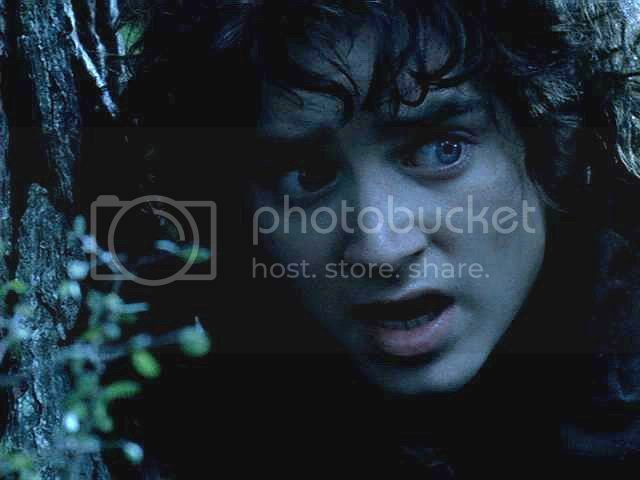 I would love to have seen more of this scrappy, resourceful (and, yes, beautiful) "Survivor Frodo". Only a few pics of TOL I'm afraid, and not very good ones, I prefer to leave that to those who do it so much better. But I did post quite a few pics of the resort. Thank you, Shireling, for commenting. Of course, it is OK to friend me! I looked at your ELF report and pics - they are the fullest I've read; thanks! The pictures were very good, too. EW looked great, but, the weather is so cold and snowy here I was actually slathering over all those flowers, swimming pools and tropical paradise-type settings. I saw people calling you, "n_a" or "NA" in the comments. Would that be your preference, in terms of an LJ name? "Would that be your preference, in terms of an LJ name?" Its cold & snowy here too and when I was looking at those Florida pics, as much as I tried, I just couldn't imagine that heat & humidity!! Just to geta little technical here, since I had a talk on this as part of my course recently; the reason that the scenes couldn't be as dark as they should have been is because PJ shot LotR on traditional film (as in print reels), and that only has certain grades of darkness, and anything ranging from darkest grey to pure black all blurs into one big mire of 'darkness'. The scenes have to be shot with more light or else the audience wouldn't be able to see anything that's in the darkness happening. If it had been shot on Hi-Definition digital cameras however, the scenes could have been much darker, but alas, the technology was not readily available then. Although, I do agree that Sauron's darkness could have been a bit better, desaturating the colour on those shots just wasn't enough . . . Thanks, Frankie. I hadn't realised all that about the sorts of film and which can do darkness better than others. I certainly have seen films with scenes shot in a lot more darkness - yet viewable - than the "dark" scenes in LotR. Now I know why. I had read or heard of the production people (PJ himself?) saying that they didn't do "Sauron's darkness" in the Minas Tirith section simply because they thought the film, overall, would be too dark and dreary if scene after scene of darkly-lit stuff was shown. So they decided to shoot day time as day time in Minas Tirith, even when under seige. I still am sorry for that decision, though, as much as I understand the filmmaking logic behind it. Woo hoo - blue Frodo! 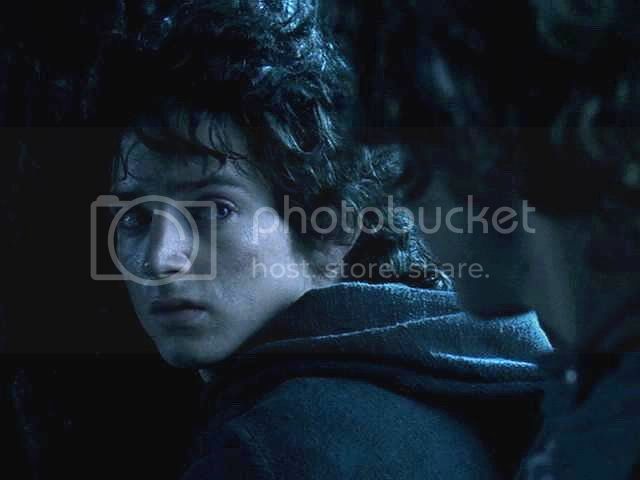 I'm almost as partial to a blue Frodo as I am to an orange firelit Frodo! 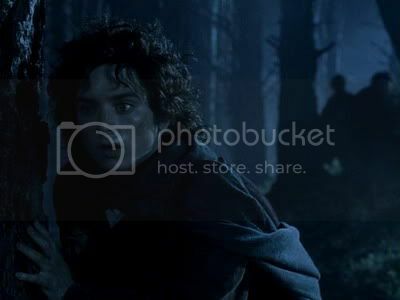 Gee, now how could I guess you'd be partial to Blue Frodo? Everything is blue in these but his eyes have a really deep crystalline quality to them. Just supernaturally gorgeous.. I end up just staring at his eyes and lips and losing track of time. His lips look really sweet in these too. I didn't notice any tweaking of the horse sounds.. horses can sound pretty ghastly just when squealing at each other playfully or flirtatiously or in actual annoyance. I wonder what that crud was they smeared all over him.. It did look sewagely nasty. I'm glad that they drowned the poor, unfortunate Nazgul horses. I feel as bad for them as I do the innocent elves that Sauron got hold of. Anyway, whichever hobbit it was.. it was admirably ballsy. Ha! I hadn't thought of that comparison, but that's quite good. Thank you, Taerie. I had never bothered to figure out who did what, too busy being frightened. 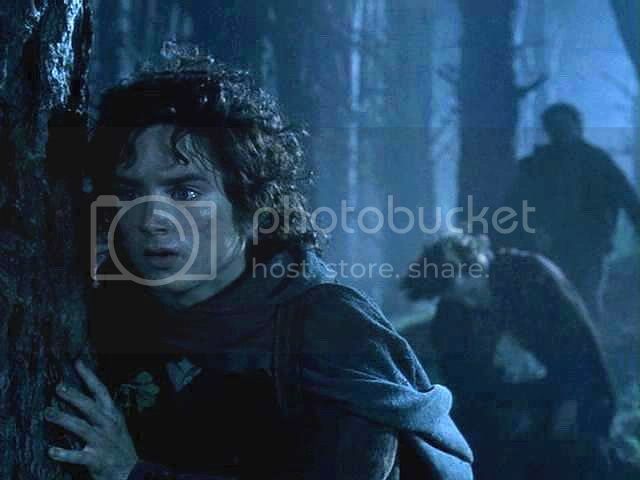 But, if it was Frodo who purposely provided the diversion, it would make a bookend to Merry and Pippin providing the diversion for Frodo to escape the Orcs at Amon Hen. Truly, considering how many other "bookends" there are in the films -- a device PJ seems to love (me, too) -- I feel sure you are right. P.S. Thanks for the note on horses. Yes, they do have a wide range of sounds, including frightening ones, don't they? And you should know! P.P.S. Thanks for drawing my attention to the "crystalline" quality of his eyes in these frames. That often seems to be so with his eyes. In Willow-wode's epic fanfic, I believe she described them as "rainwater" blue eyes, at other times, "star-washed." I think these are yet more ways to describe the same thing. Elijah Wood, unlike Cate Blanchett, did not seem to need the aid of a "Galadriel light." This was the first scene they showed, here on the TV, in the so called “what’s-on-at-the-movies” weekly reports. A fabulously dramatic scene which scared me no end. I only wish they had made it a bit longer. I do love a bit of drama. "Glistens in the night". Really! Frodo, as usual, is stunning in all of them. P.S. I just saw your post in The Harem. "Free at last," ey? You sounded celebratory in the thread, and I hope you weren't being ironic. And I really hope that whatever is your new job, it doesn't cut so much into your writing time and your health. Yes, truly happy, not at all sarcastic. I like to take unstructured time off, and am really looking forward to the break. I will do my best to find future work that does not take a toll on my joints and nerves. My very best wishes, Mariole. We all want your imagination to soar (dip? ), as well as all your typing muscles in good shape. Not to mention well-stroked nerves.